Flowers white and fragrant. We usually call this plant with a beautiful, Lily. Beauty white flowers enthrall people. Some of them use as cut flowers, to decorate rooms. Lily is a wide sweep leaved plants, like banana leaves. Among the leaves appear this is the flower Lily flower stalk length. Lily flower itself shaped like a shovel and a white fragrant smell. This plant can be placed in and outside the room. To plant and care, that require extra attention. Lily liked the moist planting medium. When the planting media has dry, growth will be disturbed, he is usually reluctant to flower. On the other hand, the beautiful is also not like excessive humidity. Water or planting medium is too wet, you can create a root decay. So, flush media only if the planting media dry. Lily, as well as other plants, but also need sunlight to fotosintesis. But you need to protect from the sun is too hot. It is a good idea, put Lily in a shady area, but still get the sun. If you put it in the room, removing the laborious, at least once in three days. Can not be denied, the day the more air pollution there. Unwittingly in the house we are not free of toxic gas (pollutant). For example, formaldehyde is in the normal liquid solvents, Benzene originating from cigarette smoke and plastic materials, or trichloroethylene that are common in the ink and paint. Various pollutant gases can neutralisize earlier by the plant. Not all plants can absorb pollutant gases. Spathyphyllum or Lily is the one that is able to absorb the gas. Based on research, Lily and effectively absorb neutralisize Benzene. 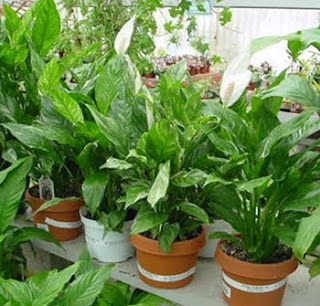 Ideally, a plant can absorb pollution Lily on the size of space around 9meter square. So, in addition to beautiful, Lily should be placed in the room than the room as decoration, as well as absorption of air pollution.